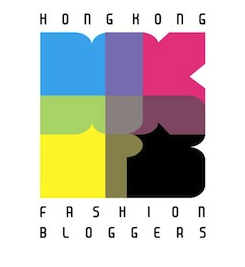 ← Freeing HK review – free is the magic number! Now I know what you’re thinking. That dreaded word… Mime. But don’t worry, I have as little interest in men wearing berets pretending to be in glass boxes as you do! 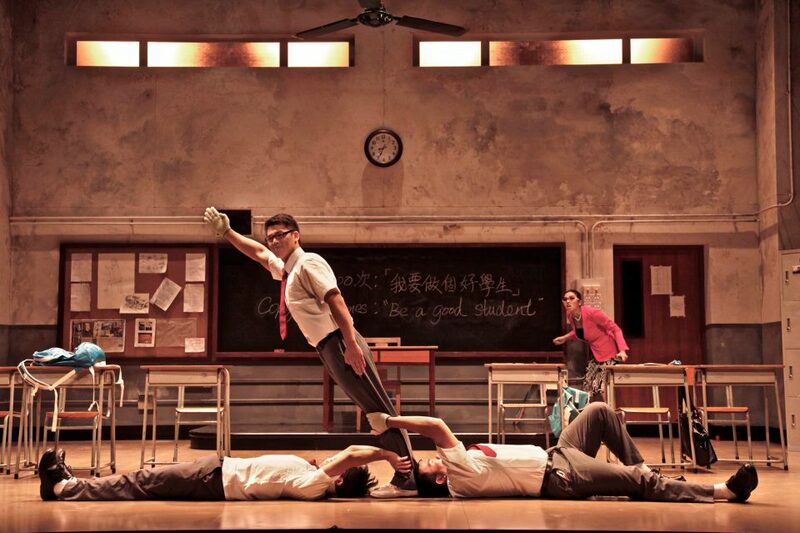 Instead, Detention (formerly known as Beating The Classroom) is a non-verbal physical comedy that blends dance, music, Chinese opera and even kung fu – and all with a hefty dose of trademark Hong Kong style humour. The plot itself is fairly light – three naughty schoolboys get stuck in detention with the prettiest girl in school, under the watchful eye of a rather feisty teacher – but it’s all about the execution! Imagine Stomp crossed with a street dance crew in the style of a Stephen Chow movie and you’re pretty much there. 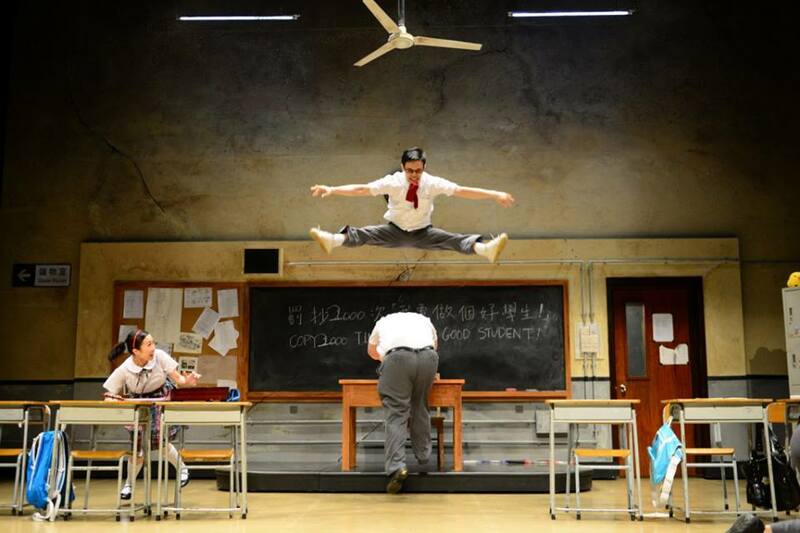 With so few actors and so many stunts and set pieces to whizz through, Detention is a physical demanding and energetic show, so three young casts rotate throughout the play’s run. On my day, I thought the two standouts were Mayson Tong (Boy with Headband) and BabyJohn (Boy without Headband), who turned in performances that were funny and dynamic without feeling overly affected. Watch out in particular for BabyJohn’s stirring rendition of Minnie Riperton’s Loving You with an epic final note, plus his fun audience participation skit (that audience member was either a plant or commendably quick!). They’re complimented well by the sweet Lin Ying Shi as the Girl Student, plus Winwei Tsai as the Boy with Glasses – the latter in particular busts out moves like you wouldn’t believe and definitely has more comedic smarts than his somewhat ‘third wheel’ part gives him a chance to showcase. However, whilst the Teacher character is definitely intended as the scene-stealer role, I did feel that Lai Yuk Ching occasionally over-egged it, particularly in the facial expressions department (although she’s a definite master at the HK-style selfie!). I was also especially impressed with the set – it’s instantly evocative of a classroom and has lots of great elements and props that you don’t even notice until they come into their own being repurposed by the cast. Whilst there might have been a few cultural references I didn’t quite understand, there was lots of Hong Kong humour I did recognise (and if you’ve seen a couple of TVB dramas, HK movies and kung fu films in your time, you probably will too) – but there’s even more universal jokes that everyone should enjoy. There are plenty of genuine laugh-out-loud moments to be had and when all Detention’s actors join forces for the show’s big musical moments or stunt-filled action pieces, the show really takes flight. Clocking in at just 73 minutes, it’s a show that never outstays its welcome – although it could definitely be made tighter still, with a slicker edit and a smoother flow (it retains a very episodic feel). Plus, any show that includes a reference to Mighty Morphin Power Rangers is a winner in my book! Having never been to the Shouson Theatre at the Hong Kong Arts Centre before, I thought it was a really great space – not too big, not too small, comfy seats and kitted out professionally (it reminds me of the Djanogly Theatre back in Notts). Overall, it was a highly entertaining afternoon, whilst the originality and inventive elements of the production, plus the sheer verve, brio and likeability of the cast, carry it through its slower moments. 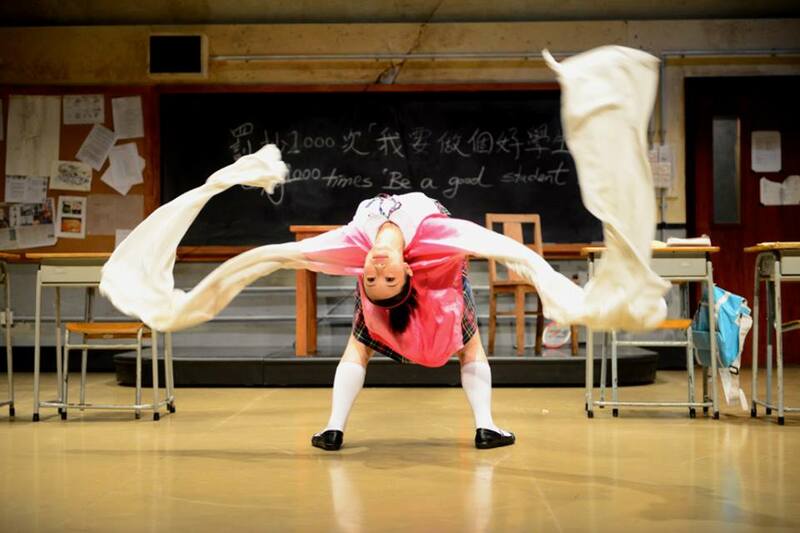 Detention’s director Tang Shu-Wing has said that Hong Kong needs an international touring show, and this was his attempt to create one. Whilst it’s far from perfect, Detention is definitely a step – or rather, a somersault! – in the right direction. As a representative of original homegrown theatre in the 852, it’ll do very nicely thanks. 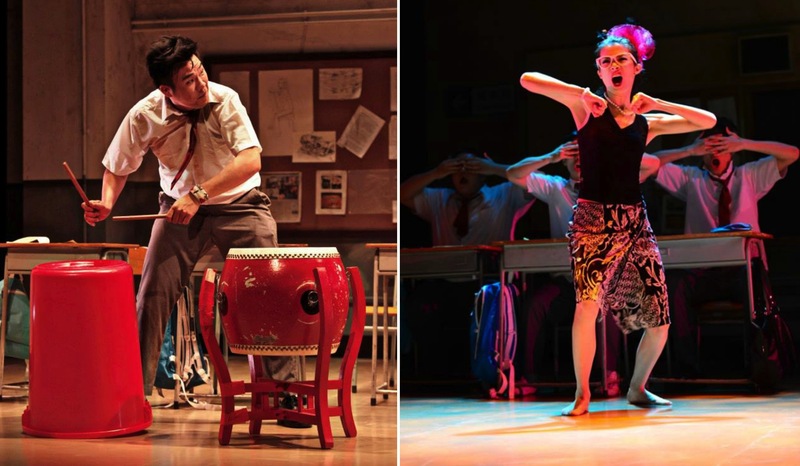 This entry was posted in Culture, Hong Kong, Theatre and tagged BabyJohn, Beating The Classroom Hong Kong, comedy, dance, Detention HK, Detention Hong Kong, Hong Kong Arts Centre, Hong Kong shows, Lai Yuk Ching, Lin Ying Shi, Mayson Tong, original Hong Kong productions, percussion, review, Shouson Theatre, Tang Shu-Wing, Tang Shu-Wing Theatre Studio, theatre, Winwei Tsai. Bookmark the permalink.